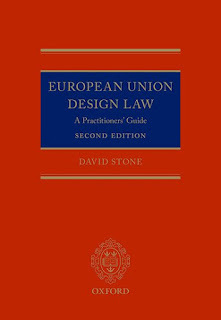 The Second Edition of David Stone's design classic: European Design Law: A Practitioner's Guide is officially an award winner (Best Design Book - Kat pat!). Read on to find out why it deserves this illustrious award. For readers in search of a reminder regarding the first edition, see Darren Smyth's post here. The book is both readable and (relatively) concise. It covers the key things you will need to know in practice ranging from the relevant case law through to practical considerations when filing a Registered Community Design. The clear writing style makes it accessible for all IP practitioners, whether or not they grapple with designs on a day to day basis. Given the amount of wisdom it imparts, it is exceptionally good value. David's particular bugbears are evident including the fact that designs only protect visual features (not those experienced by other senses) and the identity of the informed user (for the few unfamiliar, he's not a fan of the approach taken in the infamous pogs case PepsiCo, Inc. v Grupo Promer Mon Graphic SA. C-281/10 P ECLI:EU:C:2011:679). This is a great book which is well worth adding to your law library. I have no doubt that a third edition will follow. Over ten years after the beginning of the Community Registered Designs system of the European Union (EU), the Office for Harmonization in the Internal Market (OHIM) [now the EUIPO] and European courts continue to grapple with many of the new legal concepts introduced, making this a complex and fluctuating area of law. This new edition of the highly-respected English-language text offers a concise, accessible and highly readable volume covering the complete design law of the European Union. It offers a concise history of the legislation's development and aims, tracing the introduction of fundamental changes to the protection of industrial and ornamental designs throughout the EU. This is followed by a detailed and comprehensive examination of the interpretations provided by OHIM, the Court of Justice and General Court, and the Community Design Courts of EU Member States. The book quotes primary legal provisions in context, supported by extensive citation of case law from the Court of Justice, OHIM and many European jurisdictions. Chapters cover topics including the definition of terms, the system of courts and tribunals with jurisdiction for Community design disputes, overlap with other intellectual property rights, exclusions from protection, the right to the Community design, interpreting designs, disclosure, invalidity of prior design and novelty arguments, the procedure of OHIM, infringement and applicable defences, jurisdictional issues, and the Design Directive. European Union Design Law: A Practitioners' Guide is an essential reference text for practitioners throughout the European Union and beyond.